It\'s time for the second half of the combo of albums that I didn\'t really want to review, but was forced to by the supreme dictator of this site, PP. 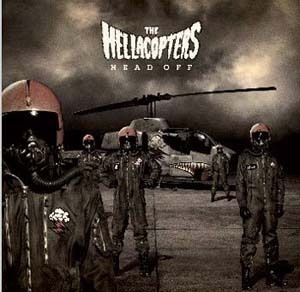 This time we\'re dealing with the Swedes in The Hellacopters, and their final album \"Head Off\". An album recorded by a band that have announced their break up and are currently setting off for their farewell tour. I\'ve never followed The Hellacopters, so when other reviews claim that nothing has happened stylistically on the last two or three albums, I\'m not the one to verify it. 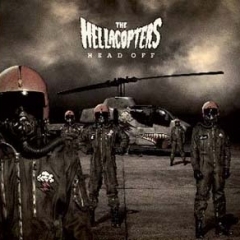 To me, as a newcomer, Hellacopters immediately sound like they just wanna rock and roll in the good old fashioned way, just like everybody did back in the 60\'s and 70\'s. Kiss comes to mind when listening to their straightforward up-tempo rockers and for a while it\'s really all rather enjoyable. Opener \"Electrocute\" impresses with its energy and initially I have trouble seeing what everyone\'s complaining about. It does not however, take more than two or three spins before the cracks in the statue begins to appear. As I\'ve understood it, the songs on \"Head Off\" are written by others for The Hellacopters, and this seems perfectly in line with how uninspired the music sounds. It\'s like, after \"Electrocute\", the guys have already run out of breath, and effectively the rest of the album sounds like routine-work. Sure it\'s tight, but there\'s just no spark to it. 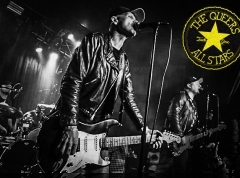 When you play music in a style that\'s been around since the 70\'s you\'ve got to be able to vitalise it with something of your own, and at this, The Hellacopters fail miserably on this record. Like you\'d expect from a band that\'s breaking up, they just don\'t seem to believe in it anymore. Effectively this album ends up seeming rather pointless, and all there\'s left is to hope for The Hellacopters to do better on their farewell tour than on the record. People who like their style of music should be able to find other bands out there who are coming up rather than coming down.